ECO NEWS: End The Canadian Seal Hunt! 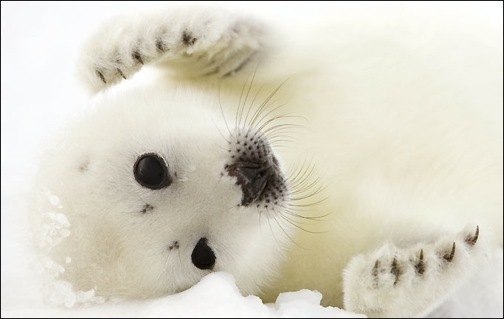 End The Canadian Seal Hunt! Who couldn’t love that adorable face? Apparently, Canada’s Department of Fisheries & Oceans, which recently authorized a 2011 hunt quota of over 400,000 harp seals. This annual slaughter, part of the Canadian government’s marine ecosystem management program, has risen to record numbers after a historic lull that lasted from 1983-1995 (when an average of 52,000 seals were killed each year). Why such a steep climb in the killing of these cuddly cuties? Those crafty Canucks found new markets for the pelts of 3-week-old seal pups (apparently Cruella de Ville is alive and well and living in Asia). But being bludgeoned to death isn’t the only threat to the seals: Global warming and the melting polar ice caps have greatly contributed to their mortality rate as well. Harp seals need big, solid ice floes upon which to give birth, as seal pups are unable to swim for the first few weeks of their lives. The ice cover this year is the worst in recorded history, which is causing the baby seals to drown in record numbers. But that hasn’t stopped Canadian DFO Minister Gail Shea from signing off on the largest seal cull ever.